There is no need to worry if these Sirens call to you. Click here to play! You see, the Sirens didn't realize they were calling sailors to their dooms. They just wanted to unload some of their burdensome treasure and figured the sailors were just bad at sailing. The Sirens never thought their voices and incredible bodies would be distracting to a group of men who had been on the ocean for months at a time. Well, now that the Sirens have learned their lesson, you can go claim their treasure. Living away from civilization as they do, the Sirens have no real need for money. Anyone who comes by can just take what they like, whether they’d like a bronze helmet, some pottery, priceless harps and swords, or just a whole mess of gold. Travel to the home of the Sirens slots, where the Sirens now stay silent so you can take away their treasure without wrecking your ship on the rocks. They'll sing if you like, but you have to be anchored first, and they don't like criticism. 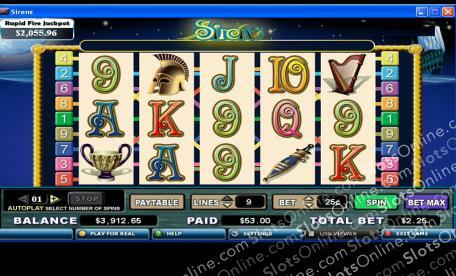 The Ship symbol is the scatter, and it pays out on the total bet when 2 or more land on the reels. The Hero symbol is wild, and it can substitute for all symbols other than the scatter. When Orange, Green and Pink Sirens appear on reels 3, 4 and 5, the bonus is triggered. 15 free spins are awarded, and all prizes are doubled during these spins.